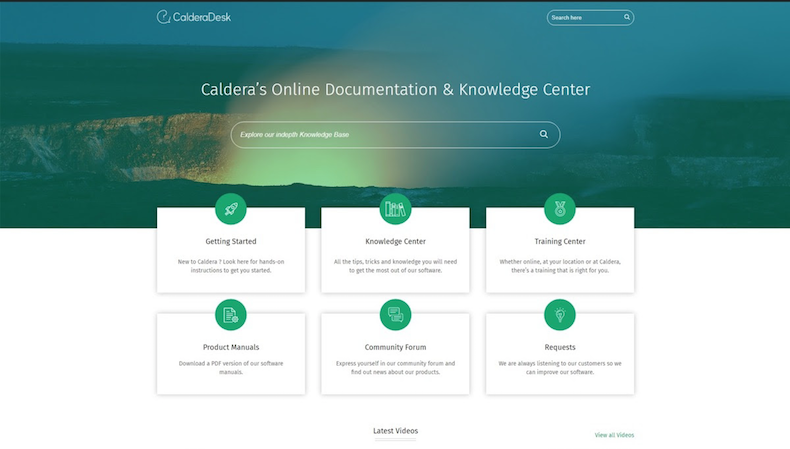 The new portal will give Caldera users access to a wide range of tools, including tutorial videos and information about Caldera training, an interactive community forum and a library of Caldera support documentation. Login credentials will be provided to accredited users upon application. With CalderaDesk, the company continues to lead the way in innovating and developing new tools to enable their customers to be more productive. The portal has been designed to give Caldera software users all the resources they need for getting the most out of the Caldera products they use. It’s an area in which Caldera has always invested considerable time and energy, with an ongoing series of training and product information videos, as well as having extensive solutions and support sections on its website. Within the new Caldera RIP V11.2 release, contextual HelpLinks have been added for a direct access to CalderaDesk overview pages. The question marks links are available in all modules and drivers, allowing for a faster and more focused access to documentation on the CalderaDesk portal. The new portal will take users through to the CalderaDesk landing page, where they will be faced with a choice of Getting Started, Knowledge Base, Videos, Community Forum, Training Center, Product Manuals and Requests. The final section, titled Requests, offers an opportunity for individuals to make requests or suggest ideas to the Caldera software development team, allowing users to influence Caldera products as well as learn about them. “CalderaDesk is an undertaking that allows us to bring the customer experience to the forefront of all we do," commented Caldera vice president Marketing and Communications Sebastien Hanssens. Industry members that are keen to learn more about these exciting new launches, as well as the many other solutions on offer from Caldera, can visit the manufacturer at FESPA global print expo. Taking place from May 15-18 at the Messe Berlin, in Germany, the exhibition will play host to many major brands from across the global market. Caldera is just one of a host of industry heavyweights that will be in attendance at FESPA 2018, with visitors able to find the company at booth C12 in the sold-out Hall 2.2, alongside the likes of Epson, EFI, Sun Chemical, JK Group, Roland DG or MS Printing solutions.